GHMC Result 2018: Greater Hyderabad Municipal Corporation has announced Technical and Non-technical merit list for qualified candidates at onlinercues.in. Actually GHMC had conducted the Technical and Non-technical written test on 27th May. Many of the hopefuls seeking to get GHMC jobs have appeared for the written test in the allotted examination centers. As per the reports, a huge number of competitors have clashed for GHMC posts this year. All the competitors anticipating to know more details such as cutoff marks, result, and Selection merit list details can go through the following article. Greater Hyderabad Municipal Corporation (GHMC) – RCUES is the Telangana state-level organization that monitors various municipality related issues in the state. The GHMC annually issues various recruitment notifications to hire the suitable candidates into various designations. This time the GHMC has released the notification for 175 Technical/ Non-Technical Work Inspector posts. Many of the aspirants having the suitable eligibility criteria have applied for the announced posts. Almost all the applicants have clashed for the GHMC Technical/ Non-Technical Work Inspector written test on 27th May. The examination has organized in 2 different schedules in morning and afternoon sessions. The technical and non-technical written test has conducted in morning and afternoon shifts respectively. Though, the GHMC announced few posts, the competition is high for the announced posts. SC, ST and PH categories is 35%. THE FINAL SELECTION OF CANDIDATES FOR APPOINTMENT TO THE POSTS SHALL BE BASED ON THE MERIT LIST. IF THERE IS A TIE BETWEEN TWO CANDIDATES, SELECTION TO THE SAME VACCENT POSITION WILL BE RESOLVED BY CONSIDERING TOTAL MARKS OF SSC/ ITI RESPECTIVELY. IN THIS REGARD THE DECISION OF RECRUITING AGENCY & GHMC, TELANGANA STATE WILL BE FINAL. IMPORTANT: Securing of minimum qualifying marks alone will not make the candidate eligible for final selection. The GHMC Technical and Non-technical work inspector Result, cutoff marks, selection merit list will be accessible to download on, rcueshyd.gov.in/ OR onlinercues.in/ OR ghmc.gov.in. As per the announcement, the GHMC result will be announced after 3-4 weeks after the examination. That is the GHMC department is expected to release the results in June/July (approximately). Competitors can stay checking the official portal of GHMC to check the exact result date. ” The Merit List consist of only Qualified Candidates”. 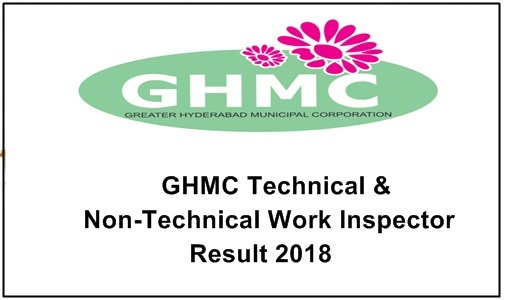 On the homepage “GHMC technical and non-technical work inspector Result 2018” Link appears on the screen. v. jyothi , i got 42 marks in exam i belongs to st category there is any chances to get job? sir iam ramu i got 78 marks in exam i belongs to bc-a catageroty there is any chances to get job?